In Ancient Egypt Isis, Nephtys, Neith and Serket formed a team of four goddesses, who protected the caponic jars containing the organs of the dead. 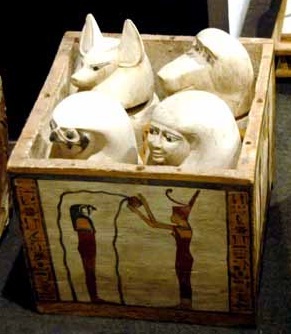 For that reason Egyptians depicted these four goddesses in the canopic chests and sometimes also in sarcophagi. We know that the link of Isis and Nephtys with the corpse is related to the Osiris Legend and to their mourning rite for helping him in his final resurrection. But, which attributes did Neith and Serket have for being part of that divine quartet? In the case of Neith maybe the link would also be related to the Myth of Osiris, and concretely to the incident of the battle between Horus and Seth. This Ancient Egyptian myth tells how Horus had to revenge the death of his father Osiris at the hands of Seth. In the most popular version Horus and Seth battled, with the resulting bloodshed, which ended with the victory of Horus.